If you have been wanting to buy some of those gorgeous green gooseberries but are not sure what to do with them, let me help you out. 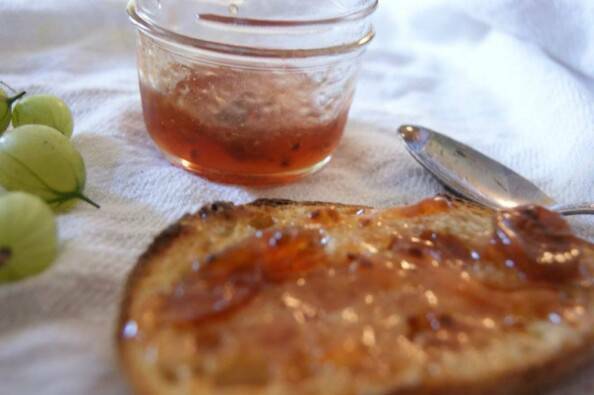 First of all, make yourself some gooseberry jam. Hands down my favourite jam in the universe! 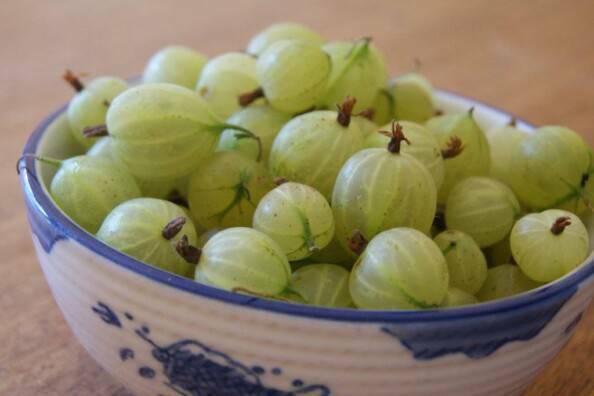 But definitely, definitely make sure you save some berries to make a jar (or four) of Spiced Gooseberry Chutney. 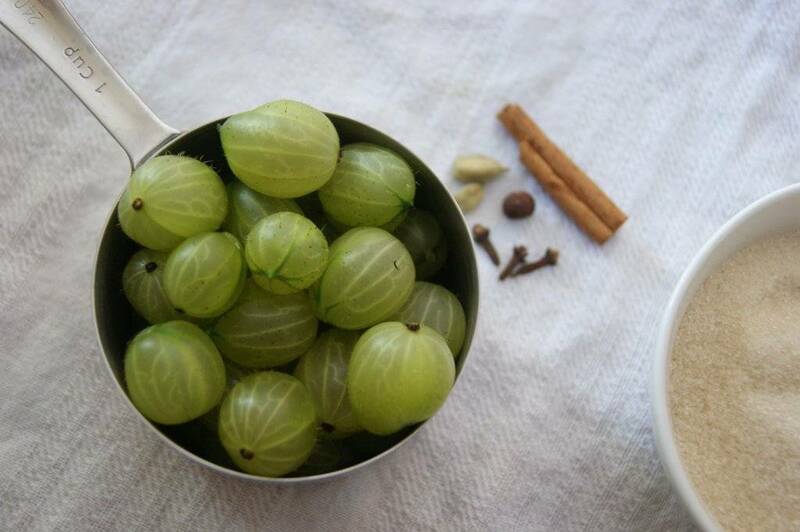 It’s hard to imagine how delicious Spiced Gooseberry is if you have never tried it. I would say that SG has family resemblance to cranberry sauce, except that I like Spiced Gooseberry way more. It’s a sweet-tart, lightly spiced condiment – incredibly delicious and the perfect accompaniment for a ham or turkey sandwich or a roast pork dinner or a spoon and your face. Can I say that I learned to make this from my Gran and that I spent hours every summer putting up chutney from my mother’s gooseberry bush? Sigh… I guess not. We did have a gooseberry bush, in fact, and my Gran was a great cook. But the only thing that ever happened to the gooseberries was that my father ate them all. Which is too bad, really, because I now have fewer years left in which to enjoy Spiced Gooseberry Chutney. I adapted this recipe from one I found last year at CanadianLiving.com, while I was searching for non-jam ideas for berries (for my Bountiful Berries cooking class, natch). I have made it several times, always fiddling with the amount of spice, sugar and vinegar to come up with what I now think of at the Penultimate Spiced Gooseberry Chutney. It’s SO good. I devoured almost half a jar yesterday on my own. 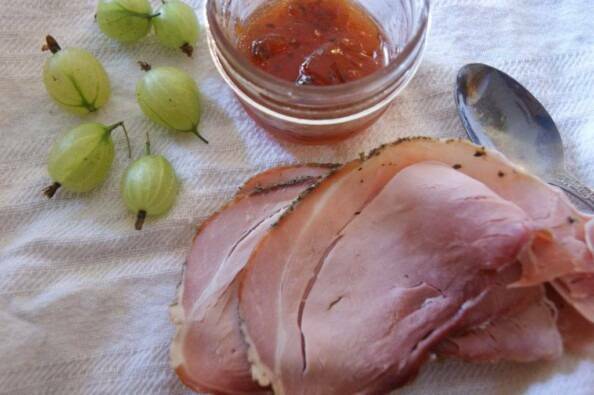 Who needs ham when you can eat a gooseberry sandwich? Makes two cups (two jars). Adapted from a Canadian heritage recipe from Canadian Living Magazine. A perfect side to serve with turkey, duck, chicken, or pork (plain or cured). 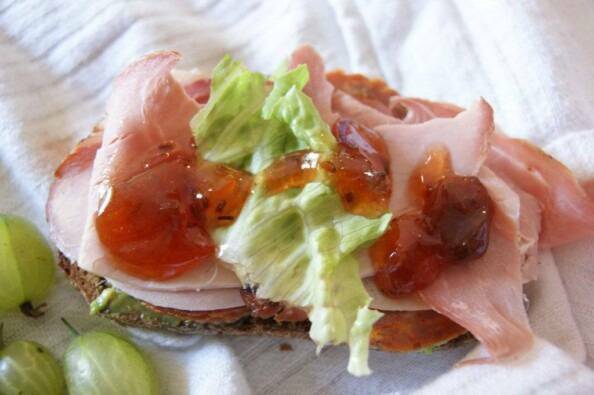 My favourite: smoked turkey and spiced gooseberry sandwich! This recipe is easily doubled or tripled. Make sure to use a large enough pot to accommodate the increase in volume. NOTE: if you don’t want to use a canner, pour the chutney into the jars, screw on the lids, let cool overnight. Store in the refrigerator up to 6 weeks. In large Dutch oven, stir together sugar, vinegar, water and salt. In a double thickness of cheesecloth, tie together allspice, cinnamon, cloves, and cardamom; hit a few times with rolling pin to crush spices and release flavour. Add to pot. 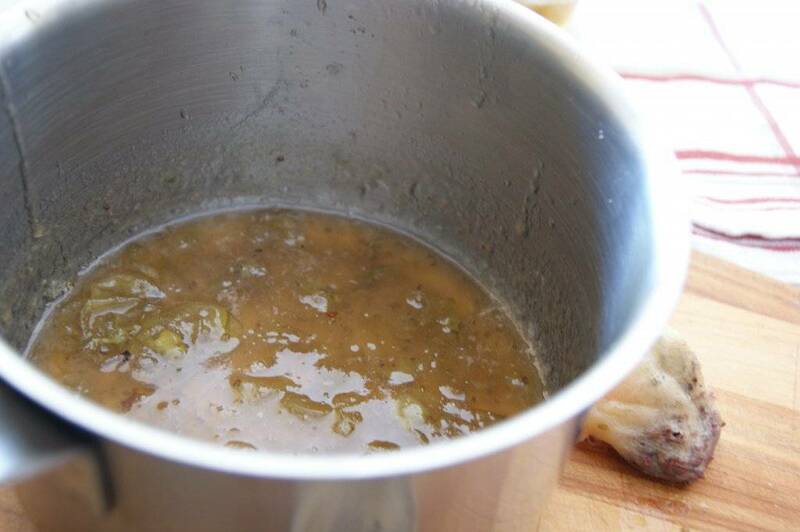 Bring to a boil over high heat; reduce heat to low and simmer, uncovered, for 3 to 5 minutes, until fragrant. 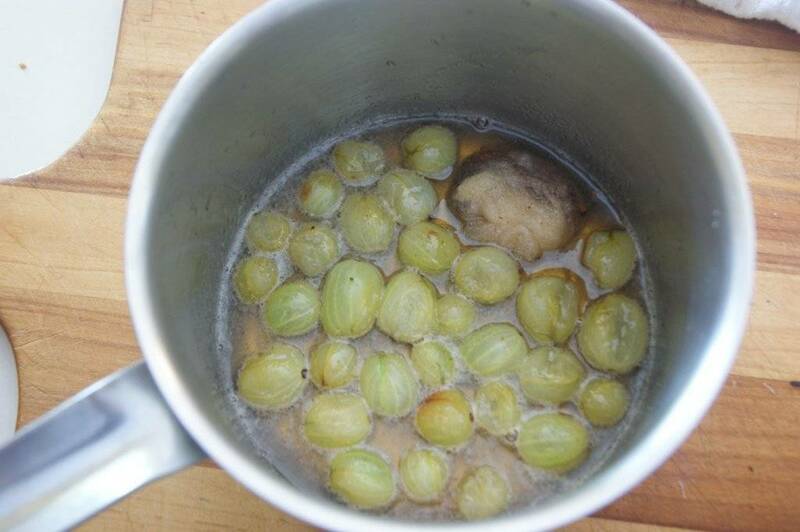 Add gooseberries and return to a boil. Reduce heat and simmer, stirring frequently and adjusting heat so sauce bubbles very gently, until thickened and berries are tender, about 25-30 minutes (this may take more time with a doubled or tripled recipe). Remove spice bag. Holding firmly with tongs, press the bag against the inside of the pot to squeeze the juices back into chutney. BE CAREFUL while doing this! Discard bag and spices. If you are not canning the chutney, ladle it into clean jars, screw on the lids, and let cool overnight. Store in the refrigerator up to 6 weeks. Or you can serve within an hour or two (as long as it is cool enough not to burn your mouth). 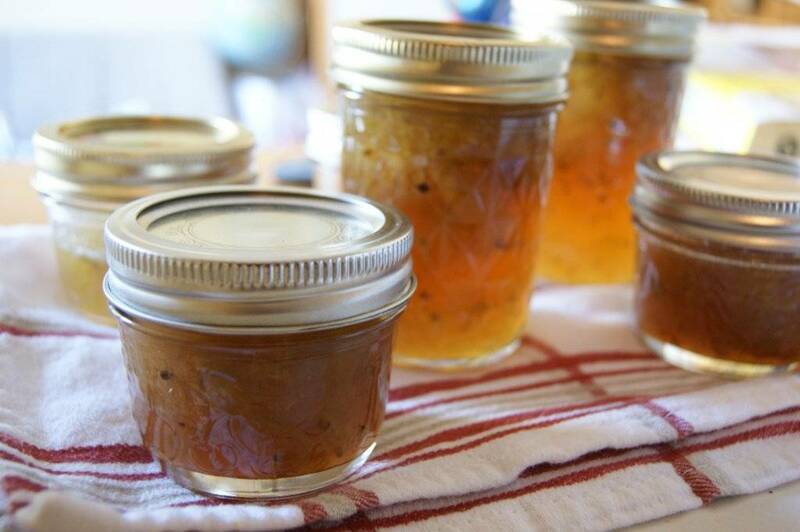 To can the chutney: Ladle into 2 1-cup (250 mL) hot sterile canning jars, leaving 1/3-inch (1 cm) of headspace. Wipe rims with a clean cloth. Cover with new lids which have been kept in hot water (to soften the seal). Screw on bands finger tight. Place in boiling water canner and boil for 10 minutes. Remove to a folded cloth and let cool for 24 hours. Check seals before labeling and storing. Any that haven’t sealed can be kept in the fridge for up to six weeks. I am loving your recipes never thought that gooseberries could be used to make chutney I will give the recipe to my mother she will love it. Let me know what she thinks! Hi Emma – wow, I love to hear from my readers, and I think you are the first from Germany! I’m so glad you enjoyed my recipe. I love the look and feel of your recipe but am afraid I cant get my head around the units! Any chance you could give a metric ingredients list for those of longingly watching from outside the US? It’s the weight of gooseberries I am really confused on – I have no idea how much a cup of berries weigh!